Half-Life for Dreamcast is a console port of Half-Life for the Sega Dreamcast developed by Gearbox Software and Captivation Digital Laboratories with the assistance of Sierra Entertainment and Valve Software. It was cancelled only a few weeks away from its projected release date. Half-Life for Dreamcast was announced by Sierra on February 14, 2000 at the Milia trade show in Cannes, France. It was stated that Captivation would be handling the Dreamcast technology while Gearbox would create all of the new content. The port was to feature a new, exclusive mission pack called Half-Life: Blue Shift, along with better visuals and effects. A second disc release would have provided the online multiplayer experience utilizing SegaNet. This second multiplayer-focused game was planned to include Opposing Force's deathmatch and Capture the Flag modes (potentially along with the full singleplayer campaign as a bonus), Team Fortress Classic, standard Half-Life deathmatch, a version of Counter-Strike, and one or more of the popular multiplayer mods. Throughout development, the port's release was delayed several times, early stated to be Summer of 2000, then postponed to September, and later to November. It was at this time some publications received early review copies, most criticizing the port's low and inconsistent framerate, long load times between levels, and no online play. The game was subsequently delayed once again well into the next year. 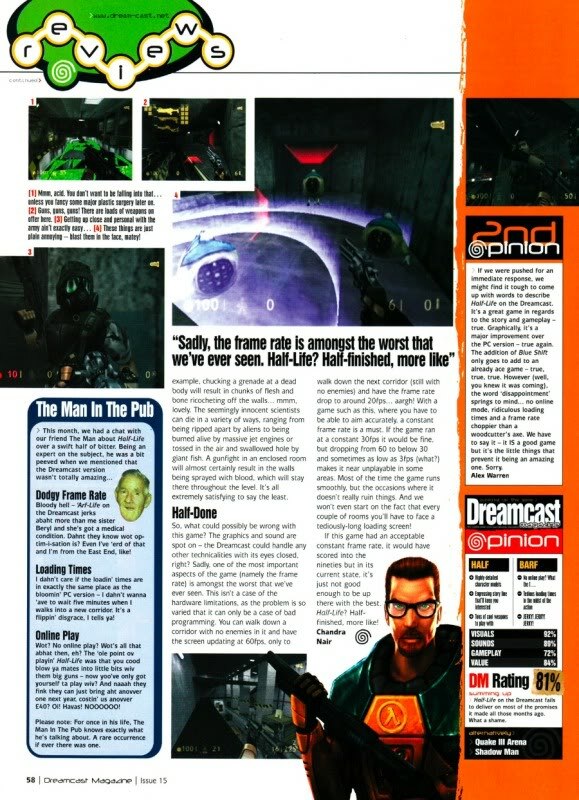 Only weeks prior to its expected June, 2001 shipping date, Sierra finally announced that Half-Life: Dreamcast was cancelled due to "changing market conditions" on June 15, 2001. A Prima strategy guide had already been printed and was ready to be shipped. The Blue Shift mission pack was later released for the PC as a standalone expansion pack. Some of the new models were reused in the Half-Life High Definition Pack, many slightly modified and presented in higher quality than was seen in the port. In 2003, a late stage build of the Dreamcast version of Half-Life, numbered 1672, was leaked to the public. This build is dated from May 23, 2001, only about a month prior to the game's cancellation. In January 2012, a fan-made port of the unused Dreamcast content was released as a modification for the PC version of Half-Life. On August 28, 2018, another build of the Dreamcast version, numbered 1638, was leaked to the public. It is dated April 20, 2001, a month earlier than the previously known build, and contains minor differences. Before Captivation Digital Laboratories' involvement, the Dreamcast port was originally planned to be developed by PyroTechnix, a division of Sierra at the time. Starting in January 1999, only one software engineer had a very short opportunity to begin work on the project, having access to the game's source code for three days, before the company received word that Sierra was closing them down, quickly cancelling this iteration of the port. Some of the enemies were removed, and most enemies fade out when killed in CPU intensive areas. The enemy and weapon stats were also tweaked. These changes are not documented in the Strategy Guide. There is no autosave feature. The player can save and load the game from the in-game options. Promotional artwork for GamePro magazine. The texture file for the startup screen. The texture file for the main menu. Models of the six soda cans. Combine OverWiki has more images related to Half-Life (Dreamcast port). This page was last modified on 3 December 2018, at 23:09.